With beautiful costumes and a massive stage show is The Beat Birds an obvious rkester at any party , Christmas party, wedding, anniversary , etc. ! 4 exuberant women who play bold '50s / '60s Rock'n Roll, with nerve , edge , humor and joy, so your legs flying across the dance floor. The Beat Birds repertoire is a cool mix of the best tracks from a time when songwriters shook lots of super hits out of the sleeve . Lots of well-known pop and rock songs that most people can sing along to . The two leading figures guitarist Louise Nathansen and singer Lene Strøyer from the band " Pistachio " , has played country thin for company parties, flea markets , Tuborg tour and Hyttefadet & warehouse in Skagen, where the summer lay audience down night after night. 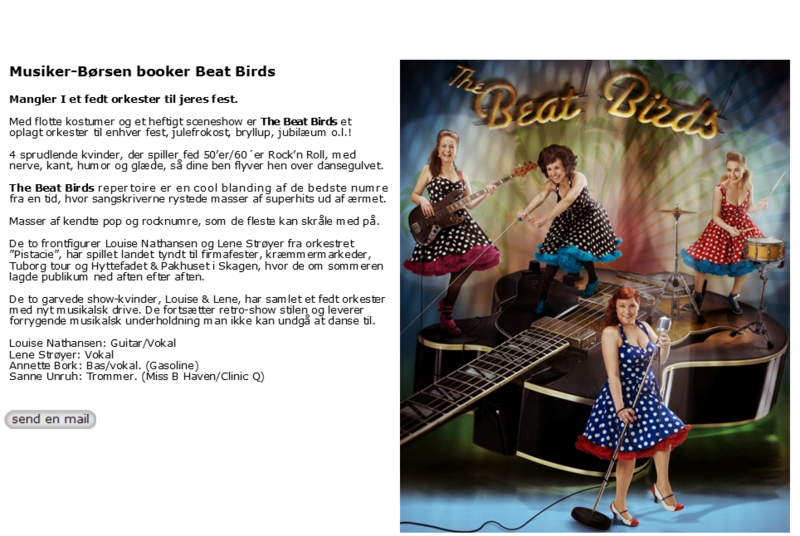 The two seasoned show- women , Louise & Lene , has assembled a fat orchestra The Beat Birds with new musical overdrive. They continue retro - style show and delivers terrific musical entertainment you can not help but dance to.